The ongoing labor dispute between Canada Post and the Canada Union of Postal Workers (CUPW) have come to an end. Canada Post has resumed service on Monday, June 26, 2011. We’re proud to announce a new layout of our Rules and Support (formerly “Help”) pages. We’ve reorganized the pages to provide a more streamlined way of getting information. Have a question? Go to Support. Want to know what the rules are, just click “Rules” and everything’s there . Check out these pages and let us know what you think! We have a lot more in store as we continue improving Listia for everyone. Thanks! Please take a moment to complete the survey (should only take a minute) to let us know how you feel. We’ll come out with a formal rule after we go through everyone’s responses. Keep in mind that all we want to do is improve the overall experience for everyone involved, so think about how you would want to be treated in both cases (remember, we are all buyers AND sellers). The most common complaint is that some buyers take too long to send shipping info and some sellers take too long to ship items. In these cases, its hard to settle disputes… so we need something in place to help everyone give and get in a timely manner. Thanks for everyone’s feedback thus far! It’s really opened our eyes on certain issues and hopefully this survey will make sure we are doing the best thing for everyone. Beginning Monday, June 20, 2011, we will be setting a deadline for a Seller’s shipping time frame. Items must be shipped within 3 business days from when the Seller receives the Winner’s shipping address and applicable payment information. Failure to do so may result in a refund to the winner if a dispute is filed after 3 business days, and the item has not been shipped. This rule has been put in place to provide a better time frame for delivery. As always, we encourage sellers to provide delivery confirmation on all items listed in an event that the auction is disputed or if the item is still en route to its destination. As a reminder, the Seller is fully responsible for securely packaging and shipping the item to ensure against damage or loss from normal shipping practices. Q: I offer free shipping, but only send out once a month. What are my options? A: First off, thank you for offering free shipping on your listings! In cooperation with this new rule, we ask that Sellers list their auctions closer to when they are able to send out the item. For example, if you get paid once a month at the beginning of each month (ex: July 1st), and want to list a 7-day auction, then the earliest we’d suggest you begin your listing is June 24th. Planning when to list your auction will help eliminate situations like these. Q: What about those who charge for shipping? How can I protect myself when we don’t hear back from the winner? A: Sellers still have the option to charge shipping, however, once you receive the Winner’s shipping address and payment information (if applicable), then you must send the item within 3 business days. Q: What if I don’t hear back from the winner? A: You are not responsible for shipping an item until you receive shipping information from the Seller. After 10 days from the close of an auction, if the winner has not responded or taken any action, then the seller can keep all the credits and you may re-list the item if you wish. Q: Does the 3 business days deadline mean that I have to guarantee that the item will arrive within 3 business days? A: No. The 3 business days applies from when the Seller receives the Winner’s shipping address and shipping payment (if applicable). Once that information is gathered, the Seller has to send the item within 3 business days. Depending where the item will be sent (whether domestically or internationally), it may take more than 3 days to arrive. Q: Are Holidays considered in the 3 business day time frame? A: No, if a Holiday lands on a weekday, then you get an extra day to ship your item (assuming you’ve received the Winner’s shipping address and applicable shipping information). For example, if you receive shipping info on a Friday and Monday is a Holiday, you have until Thursday to ship out the item. We hope this information was helpful. We have a lot more in store as we continue improving Listia for everyone. Thanks! List: To ensure you get the most out of your listing, the first step is simple and straight forward, but also very important: Creating a great listing. When listing your item, you’ll want to make sure you have a clear and direct title, detailed description, and clear photos. 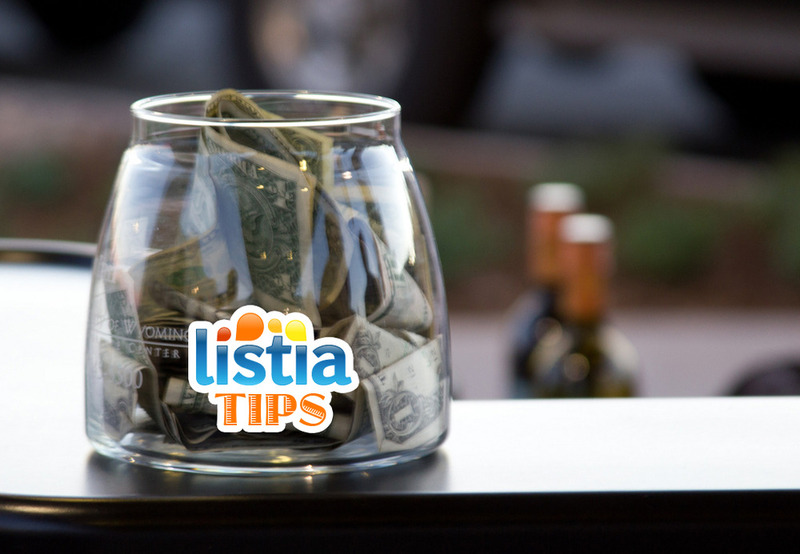 Share: Exposing your listings will generate interest among other Listians and attract more bids! Connect your account to your Facebook and/or Twitter! It will expose your auctions to people outside of Listia and bring in a new group of bidders you may not have otherwise encountered. You can also use the Bold and Premium listing features for even greater exposure. Be Active: We reward users regularly for being active members of the community! You will randomly receive bonus credits when you least expect it for doing activities such as listing, bidding, commenting, leaving feedback, and checking in. However, you don’t receive credits every time, and there is a limit on how many you can get in one day. The more you do an activity though, the more chances you have of gaining those bonus credits. Remember, we do check for abuse of these features, so leaving comments randomly everywhere isn’t going to work. Listing cool stuff, along with these helpful tips, is the fastest way to earn more credits. What other helpful tips or tactics have you used? What categories do you think are most popular? Leave a comment and share your ideas with others! Happy Friday! We’ve been working on a new dedicated feedback page and are finally ready to roll it out. Starting today, you can click on any user’s feedback rating to view details broken down by how recent they are and separated by whether they received them as a buyer or seller. To check it out, just click on the numbers next to a user’s profile pic. The page has a chart at the top so you can see how much of the feedback was received in the past 3 months, 6 months, 12 months, or all time. 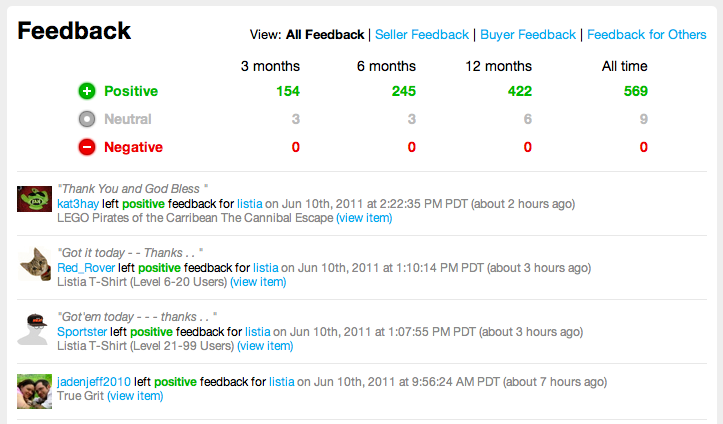 This is a great way to see if a user has been improving or getting worse. Below that, we also made it easier to browse the actual feedback that has been left by the other party. We hope everyone enjoys the new page… and remember, we have lots more in store as we continue improving Listia for everyone. Thanks!